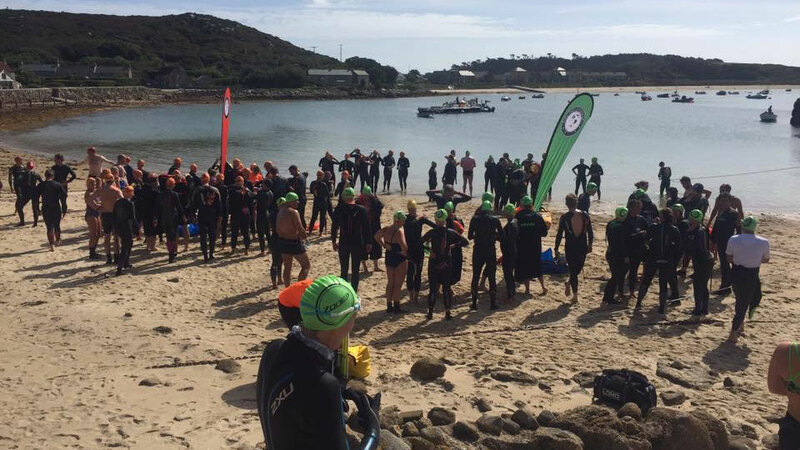 Our regular blogger, City of Derby’s Val Thorpe, tells us about her next open water challenge, the Scilly Swim Challenge in September. Some of you may have read the blog ‘10k swim? Of course you can!‘ and perhaps you’ve already swum or entered a 10k this year. But what’s the next challenge, another 10k or maybe something a little bit different? For me this year’s main focus is the Scilly Swim Challenge, 16k of swimming with 10k of walking thrown in. Based in the beautiful Scilly Isles you swim from one island to the next and then walk across the island to the next swimming point. The swim takes place in early September (although this year there has also been an opportunity to swim it in May) over either one or two days. I’ve opted to do the two day swim as I really want to enjoy it and take in all the sights of the Scillies. Also I just happen to have two swim buddies Ruth and Tamzine, who live on St Mary’s and who I know will expect me to drink the odd glass of wine with them. I’m not sure I’d be up for that after 16k in one day! Whichever option you look at, it is a significant challenge and will require some serious training. I’m hoping over the next few months to share what goes into completing this type of swim. Preparation, training both in and out of the pool, recovery strategies, nutrition before and on the day, events both competitive and non competitive (I must be the only Masters’ swimmer using the World Masters as a training for another event!) in the lead up to it and ways of keeping motivated. As you can imagine I’m hard at work in the pool and in my next blog I’ll give you an insight into my training and my first two open water events, Swim England’s Regional Championships and the Henley Mile. At least the sun’s out and the water’s warm!